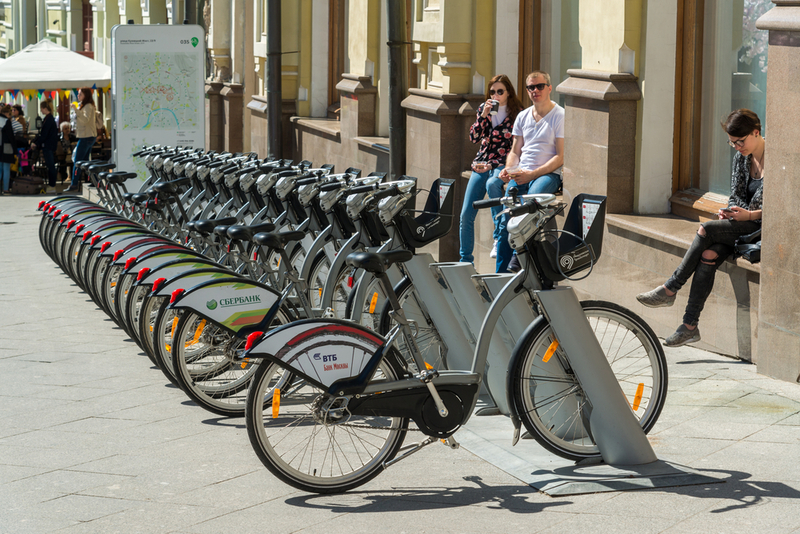 The Moscow bike rental network has some 350 docking stations, mostly in the Garden Ring area and the adjacent districts. 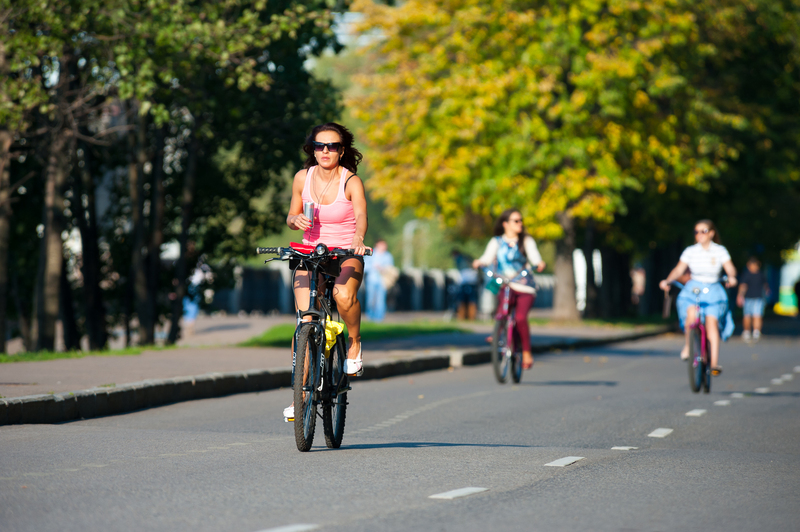 City bikes are ideal for travelling small distances,with rides not exceeding 30 minutes. Take along the bike station map, when travelling longer distances. 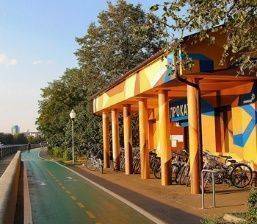 In addition to the urban bike rental service, large parks offer private bike rentals. 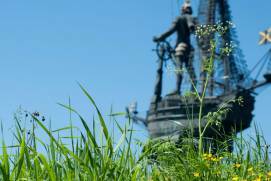 Interesting cycling routes go from Nikitsky Boulevard to the Clean Ponds, from the Muzeon Park of Arts to Victory Parkas well as in the Krylatskoye Hills Park. 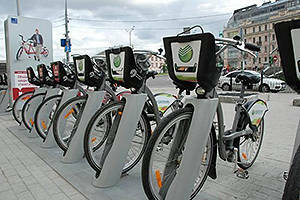 Electric bikes are available at six docking stationsin the west of Moscow; the tariffs are the same as for regular bikes. Instruction guides are available in English. 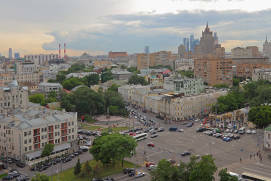 The Moscow city bike network began to develop rapidly a few years ago. Before that, stationary bike rentals were only found in some large parks. 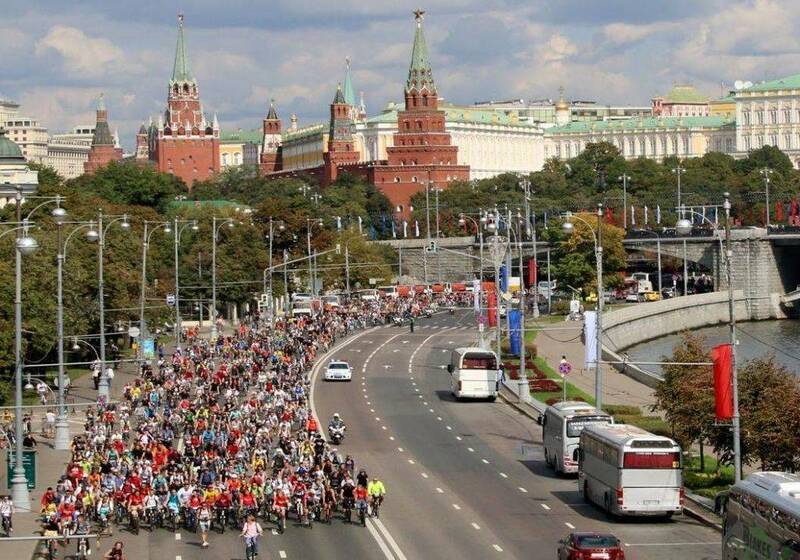 Moscow still isn’t ideal for cyclists; it has a comparatively small number of bike paths, huge distances to traverse and unfavourable weather conditions – cycling comfortably is only really possible from May to September. 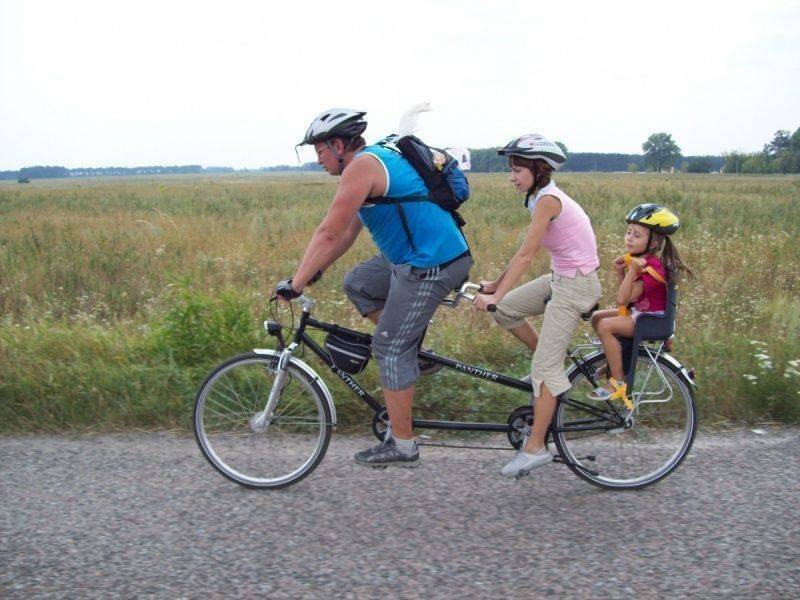 However, fans of biking don’t give up so easily. Some use bike rentals purely as a form of exercise while others just find it easier to get from one point to another using city bikes. The number of docking stations continues to grow; it is now around 350. 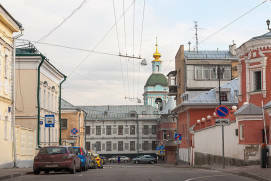 Most of these are concentrated in the Garden RingRussian: Sadovoe koltso or Садовое кольцо and adjacent districts, whereas only a very few are available in residential areas. City bikes are good for travelling small distances, especially if a ride does not exceed 30 minutes (from hiring a cycle to docking it again). 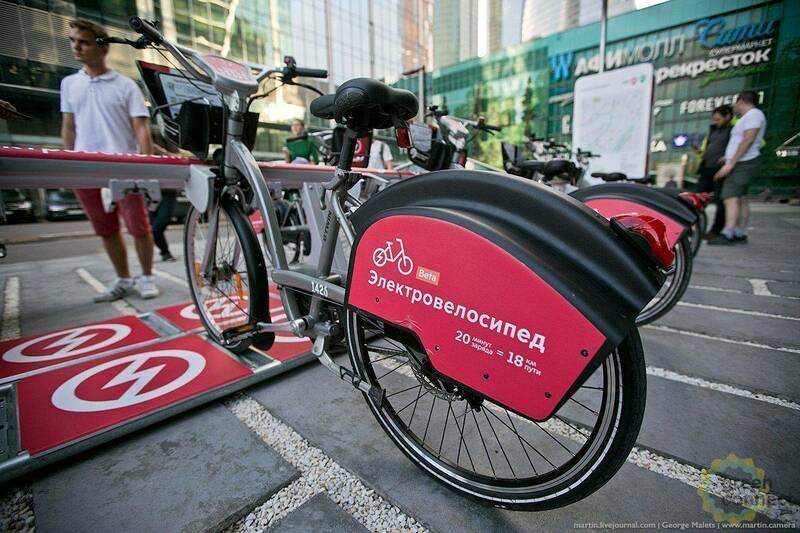 In this way, you will pay 150 RUB to access a bike for 24 hours. For longer distances, you’d better have a station map handy to be able to plan your route from one docking station to another. In addition to city bikes, there are a number of private bike rentals in the city. 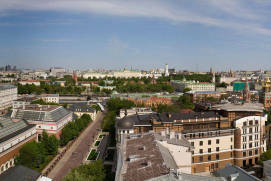 If you are using these, it is advisable to hire a bike for 24 hours; the average hourly rate is 150–300 RUB, while 24 hours costs 700–1,000 RUB. 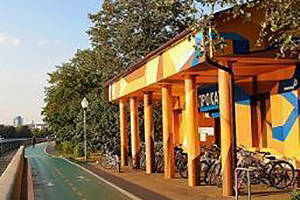 You will find private bike rentals in any large park. 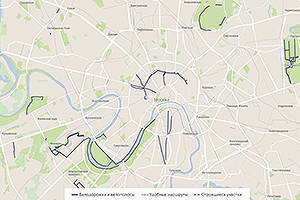 There are not many bike paths in Moscow; a map is available at mos.bike/map. 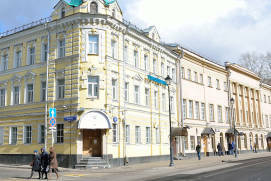 Within the city centre, the map suggests using the bike lane of the picturesque Boulevard RingRussian: Bulvarnoe koltso or Бульварное кольцо that goes from Nikitsky BoulevardRussian: Nikitskiy bulvar or Никитский бульвар through Tverskoy BoulevardRussian: Tverskoy bulvar or Тверской бульвар, Pushkinsky Public GardenRussian: Pushkinskiy skver or Пушкинский сквер, Strastnoy, Perovsky, Rozhdestvensky and Sretensky BoulevardsRussian: Страстной, Петровский, Рождественский и Сретенский бульвары up to the Clean PondsRussian: Chistye prudy or Чистые пруды. 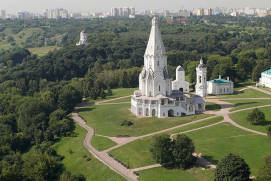 Advanced riders will enjoy the historic cycling route in the natural reserve of Krylatskie HillsRussian: Krylatskie kholmy or Крылатские холмы, constructed for the 1980 Summer Olympics. Please bear in mind that these are real hills with hairpin turns and perceptible differences in elevation. The total length of the track in Krylatskoe is over 13 km. 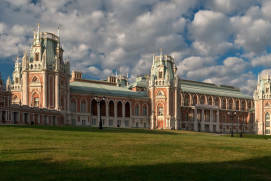 Another interesting cycling route goes from Fallen Monument ParkRussian: Park iskusstv Muzeon or Парк искусств Музеон through Gorky ParkRussian: Park imeni Gorkogo or Парк имени Горького, Neskuchny GardenRussian: Neskuchnyi sad or Нескучный сад and the Sparrow HillsRussian: Vorobyovy gory or Воробьёвы горы to Victory ParkRussian: Park Pobedy or Парк Победы – most of this route runs along the embankments of the River MoskvaRussian: Moskva-reka or Москва-река. You will need a smartphone and a bank card to rent a city bike. 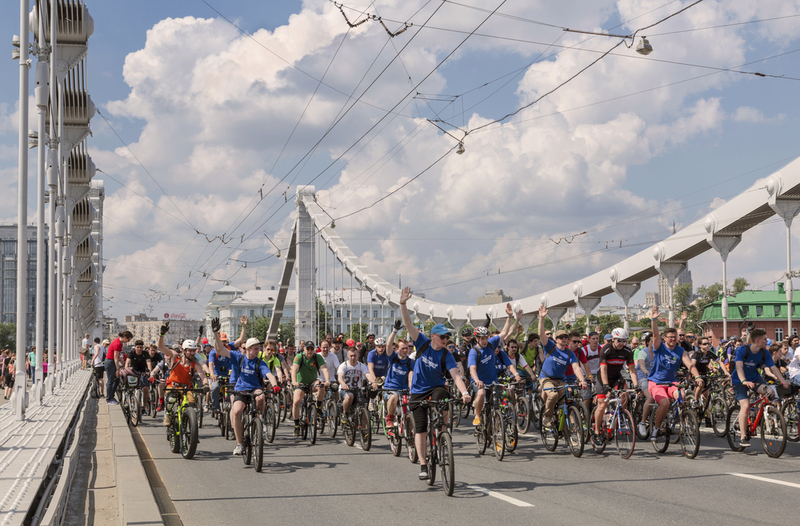 After you’ve signed up at velobike.ru, you will receive an SMS with your login and password. You can pay on the website or in the mobile app available for download from the App Store and Google Play. 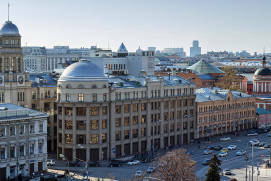 Maps and locations of docking stations are also available on the website, in the app, and on the unified transport portal of the city (transport.mos.ru/bicycle/route). Choose a docked bike and press ‘OK’ on its panel, then enter your login and wait for the confirmation beep. 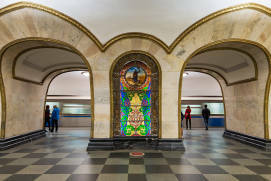 You can also pay using a Troika carda reusable card designed to pay for public transport in Moscow by holding it to the bike’s panel. You can take a bike at one station and return it at another one. To return a bike, lock it into a dock, press ‘OK’ on the panel and wait until you hear the beep and the message ‘Возврат ОК’ (‘Return OK’) appears. Bikes can also be parked outside using the built-in cable lock and the handlebar lock. 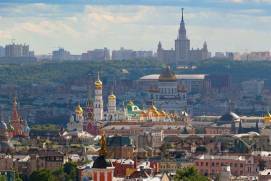 By paying 150 RUB, you get unlimited 30-min rides in a 24-hour period. 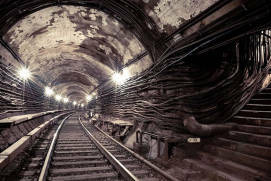 Otherwise, you can pay monthly for 600 RUB per month and there are also two three-month options: 1,200 RUB for unlimited 30-min rides and 1,500 RUB for unlimited 45-min rides. 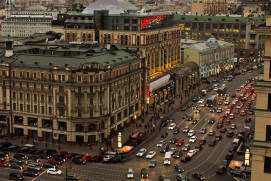 If you take the bike out for longer, you will pay an additional 30 RUB per hour, 100 RUB for two hours, and so on. Renting a city bike for 24 hours costs 3,000 RUB, which is far from a bargain. Only one bike can be rented using one account. 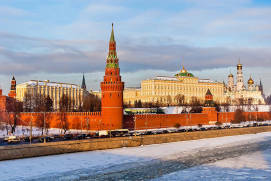 If you are fascinated with sports and active rest, if the main event of the year 2018 for you is the World Cup in Moscow, then you can learn about Russia World Cup mascot, Moscow football stadium, various opportunities for sports tourism in Moscow and sport events in Moscow on our website pages. 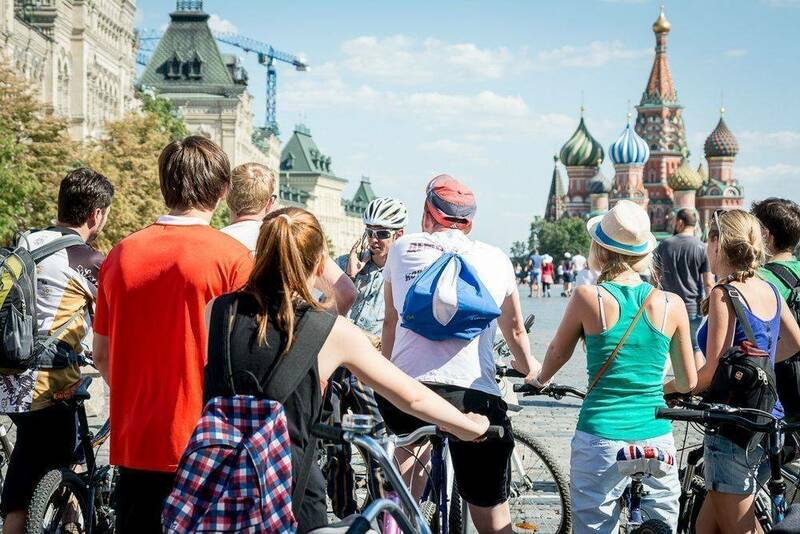 In addition to cycling along the city bike paths mentioned above, there are places in Moscow that are also worth exploring by bike. 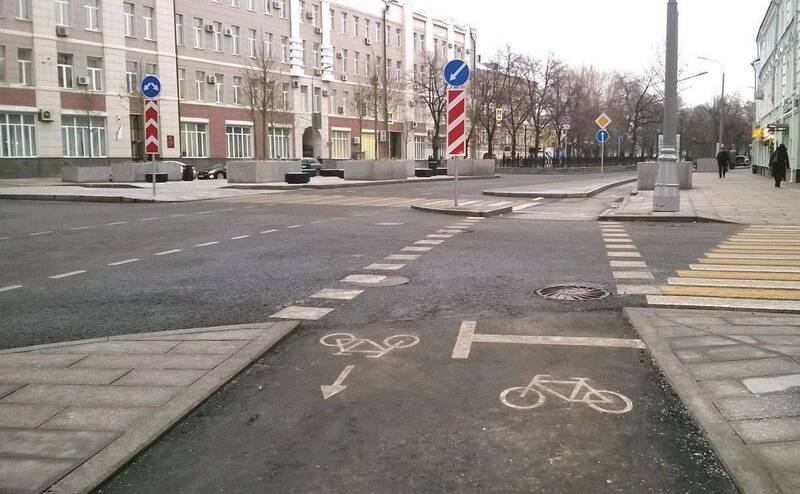 The velobike.ru city bike network offers some ideas as to route. 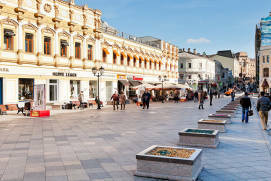 For example, the 33-km-long ‘Five ParksRussian: Pyat parkov or Пять парков’ route will suit you if you want to admire landscapes and city parks. 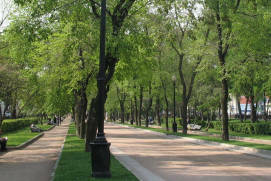 Starting near Sokolniki ParkRussian: парк Сокольники, the route runs through Yekaterininsky ParkRussian: Екатерининский парк, Fallen Monument Park, Gorky Park and Neskuchny Garden, ending in Presnensky ParkRussian: Пресненский парк. 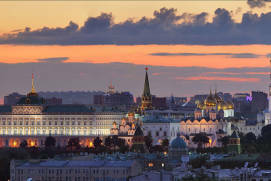 ‘Four BridgesRussian: Chetyre mosta or Четыре моста’ was the most popular route of 2016. 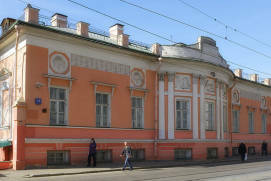 This 90-minute route starts from 4 Leninsky AveRussian: Leninskiy prospekt or Ленинский проспект, runs through Pushkinskaya EmbankmentRussian: Pushkinskaya naberezhnaya or Пушкинская набережная, includes four bridges, Neskuchny Garden, the majestic Luzhniki StadiumRussian: stadion «Luzhniki» or стадион «Лужники», and Novy ArbatRussian: Новый Арбат. 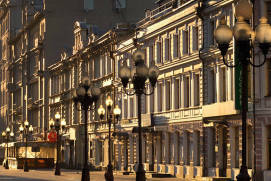 The route ends at 1 Novy Arbat St, in the very heart of the city. 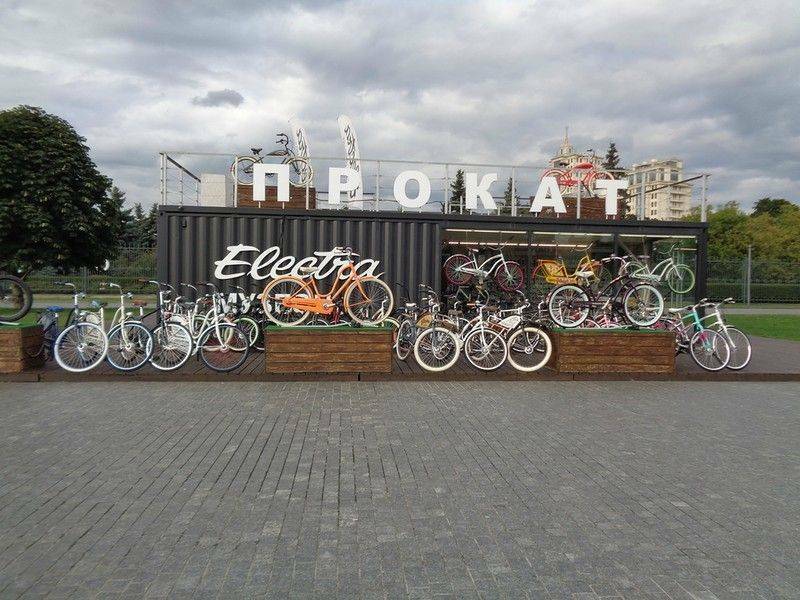 There are only six docking stations in Moscow where you can hire an electric bike, all in the western part of the city. 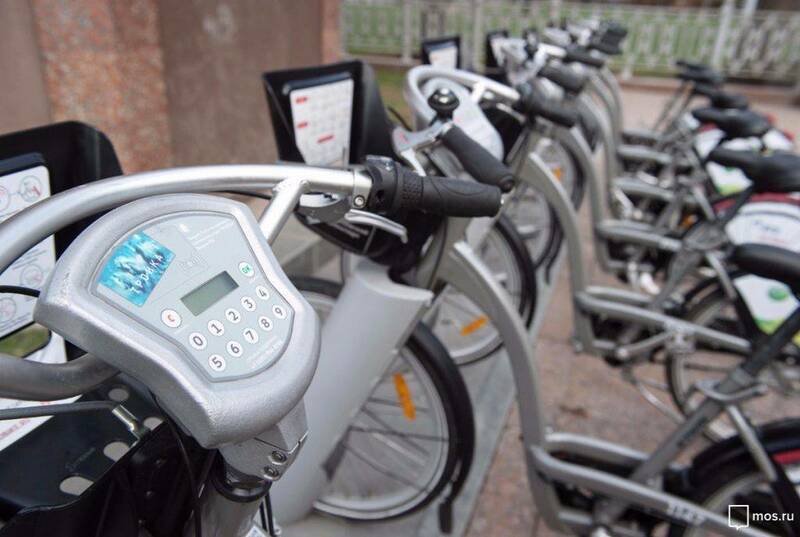 Electric bikes are available to any user of the bicycle sharing system for the same price as regular bikes. Make sure you pick an electric bike with enough battery charge: a green indicator guarantees up to 18 km, while a yellow one means you shouldn’t count on more than 10 km. If the indicator is flashing red, it means the battery is empty. To activate an electric bike, press the red button on the handlebar and push the speed shifter gently. 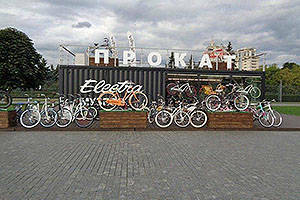 Electric bikes are to be locked into dedicated docks; a fine of 1,000 RUB is imposed for using a regular dock. An electric bike weighs about 40 kg and can go as fast as 25 km/h, so using it requires confident riding skills. These days, bike rentals are available in nearly every large park: Sokolniki, Izmaylovsky ParkRussian: Измайловский парк, Victory Park on Poklonnaya HillRussian: Poklonnaya gora or Поклонная гора, Gorky Park, etc. 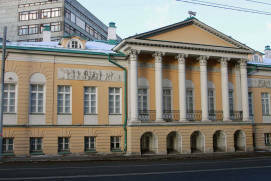 Average hourly rates are 200–300 RUB. In addition, there are some private bike rental companies outside the parks, which will be briefly described below.